This is one of my favorite expansions to Carc. It adds in several new mechanics. Abbeys are of great use because they are played to fill in holes in your game that otherwise are impossible to complete (thus allowing you to retrieve your valuable meeples that you previously thought were trapped). The mayor is a new way to claim cities as your own that can be a game changer. Barns completely reshape the way you look at fields. I suggest this expansion for someone who is well seasoned with Carc and is looking to try something new. It works great when combined with other expansions as well, especially Traders and Builders or the Tower. 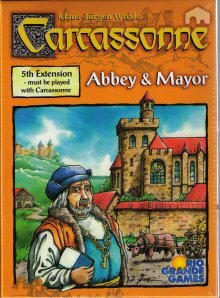 A great addition to the Carcassonne base game adding 24 new tiles and 3 new followers as well as the introduction of a wild card, the Abbey.